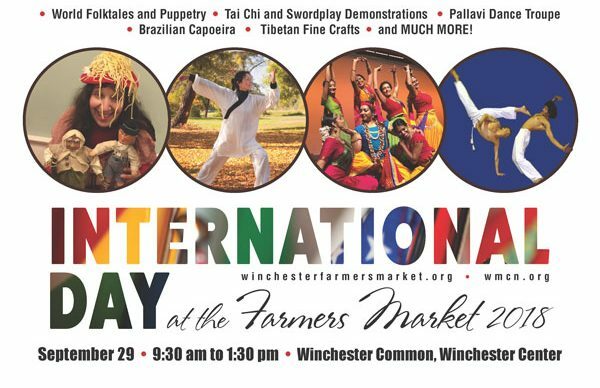 This special market day is International Day at the Market, which is sponsored by Winchester Multicultural Network as well as the Farmers Market. 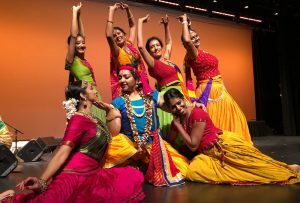 It is a time to celebrate our diversity and cultures. That means food, music, art – all the things we can share and enjoy together. Celebrating our origins with those in our town. It will be a day of celebration of our community and all the people in it. At the market, pumpkins are coming for eating and to carve.Pumpkins, squashes, onions, eggplants, and still because of greenhouses and new ways of lengthening the harvest: tomatoes and greens. Fresh and local EL Silvia, Lanni Orchards and our own hometown Wright -Locke Farm is at the market bringing the harvest to you. Kids Table for creative fun under the ole Oak tree. League of Women Voters will have a booth, important elections are upcoming this fall. An Afro-Brazilian martial art that combines elements of dance, acrobatics, and music. It is known for its quick and complex maneuvers, predominantly using power, speed, and leverage across a wide variety of kicks, spins, and other techniques. Two traditional dances. Raas is a traditional dance form from the state of Gujarat, India, and is performed during the religious festival of Navaratri, which falls in October.Ghoomar is a traditional folk dance from Rajasthan, India.The dance is chiefly performed by veiled women who wear flowing dresses called ghaghara. Artisan Goods from around the World. Karma Fine Crafts, one of whose trademarks is its connection to social justice and sustainability. Much of Karma’s wares are from women’s collectives overseas, as well as from independent artisans who create limited-edition pieces that tell a story and preserve their heritage. Chinese Traditional Crafts will be on display by the Chinese American Network of Winchester. The Chinese American Network of Winchester (CAN-Win) is a non-profit and non-partisan community organization for Chinese Americans in the Town of Winchester, MA. Founded in 2016, CAN-Win aims to preserve and promote Chinese culture and heritage, enhance neighborhood integration, strengthen engagement in community affairs, and advocate common interests in important social, cultural, and political issues. Aruna Designs is a charitable project of ArunaPartnership.org. Aruna works with a women’s craft cooperative in India, and sell their work here in the US. The project was started in the late 1980s to train and provide suitable work for widows and other single women who are disadvantaged in their society. The artisans and their now government-registered cooperatives are resilient and committed, producing a wide range of beautiful hand-made products. All profits from sales of handcrafts goes directly to Aruna Partnership (South India) to provide education for village children, support local businesses and provide shelter and healthcare for those in need. Japanese Textiles by Kiyomi Yatsuhashi, fabric artist and teacher. Kiyomi will be teaching classes on Japanese Textile Dyeing at Studio on the Common, Sept 21 to October 19. School the World is a non-profit organization which organizes trips to Guatemala every year for high schoolers to help fundraise and build a school for rural communities in need. School the World transforms lives by working to make quality education accessible to all children and families living in rural villages of Central America. “We believe education is a vital component to alleviating poverty, increasing gender equality and promoting economic sustainability.” Say hello and learn more about School the World’s projects in Guatemala from Beaujena Stoyanchev, junior, Winchester High School, who will be attending her third trip to Guatemala in February, this time as a trip leader. Village development program management. Thiou Village Project (South Sudan) deliver water, schools, teacher and student support, economic opportunity, appropriate technology, and sanitation solutions to under-served communities in South Sudan. Meet Bol Riiny, one of the Lost Boys of Sudan, supporter of the Thiou Project.